This is the National Hurricane Center's forecast track for Hurricane Irene, released at 5 p.m. Wednesday. It sounds like something out of the Austin Power movies or Robert DeNiro’s “circle of trust” in the Focker movies, but in the world of hurricanes the “Cone of Uncertainty” is just that; as the forecast goes out in time, the exact location of the hurricane becomes less certain. Therefore the official forecast from the National Hurricane Center paints an area around the expected track to reflect the average error of the forecast. You'll see the cone in the image above. The image shows the National Hurricane Center's prediction, as of 5 p.m. Wednesday, of where the hurricane could go over the next three days. 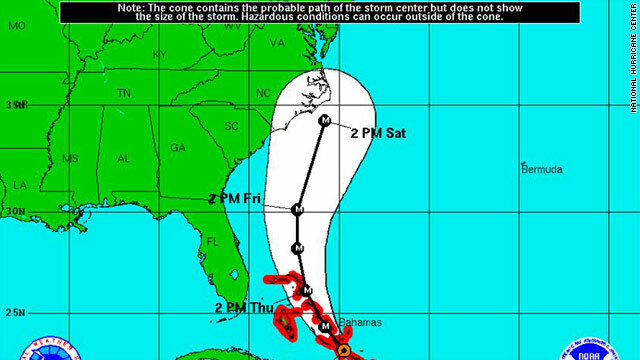 The "cone of uncertainty," representing a range where forecasters think the hurricane's center could go, is in white. The hurricane center, located near Miami, is tasked by the National Weather Service and the National Oceanic and Atmospheric Administration to constantly watch the tropics and warn when tropical waves and disturbances grow into organized low-pressure areas known as tropical depressions. When tropical depressions develop, the hurricane center starts issuing advisories on the system. Sophisticated models running on some of the fastest computers in the world ingest data from satellites, ship reports, radar (if it is available), and data from weather balloons, airplanes and weather stations. Literally billions of calculations are done with very complex equations to help model the atmosphere into the future. More than 20 different kinds of models are run - some being more reliable and complex than others - to help forecast the track and intensity of the storm. You may have seen one of our meteorologists show the "spaghetti" maps on television depicting a storm's possible paths, or seen the plot maps on cnn.com/hurricane. Forecasters use this model data - along with real-time information obtained by satellite, radar, observation and hurricane hunter planes that fly right into the center of the storm - to help the hurricane center issue an official forecast track. That forecast track, issued every six hours, shows where the storm is expected to go over the next five days and how strong the storm may be. Even I, as a meteorologist, know that weather forecasts are far from perfect. The hurricane center, which keeps records of every track it issues, is aware of that fact as well. The hurricane center figures out what its average error is at various forecast horizons - 12 hours, 24 hours, 48 hours, etc. - to help it generate the “cone of uncertainty” on its forecast track (the white area on the map). The cone basically shows that the center's 12-hour forecast position is, on average, 36 miles off. At 48 hours, it is around 100 miles off. So, let's say that I live in City X, and the storm is forecast to pass 100 miles to the south of me two days from now. I have nothing to worry about, right? Wrong. Because the average error at 48 hours is 100 miles, the storm could be right over me in two days. This is why meteorologists and emergency managers will constantly preach not to look at the line on the forecast track, but to look at the "cone." If you are inside that area, you could end up in the direct path of the storm. Because the atmosphere is so complex, errors from a particular forecast become larger over time. So the cone is much smaller at 12 hours than at five days out, because we know that on average, our short-term forecasts are much better. 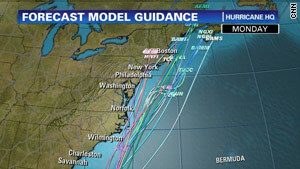 So as Hurricane Irene approaches, remember not to focus on that line you see on the forecast track maps. Instead, look at the “cone of uncertainty." In the end, the storm may go anywhere in that area. Actually, they do a pretty good job. I live in the coastal NC/Sc region and the modeling has continued to improve. Yes, the projected path changes, we all know that, and it is tweaked, but when they can narrow it down to 100 miles of so, I'd say thats pretty good. I love this. I'm watching CNN and I don't even know why, they're so dramatic. I feel like I'm watching a bunch of 14 year olds gossiping about what's going on the world. They're giving a ridiculous list of things you need in a disaster, I guess in preparation for the storm. One was to make sure you have an out of state contact and maybe a calling card in case your cell phone doesn't work. I'm not sure what people get out of these stupid segments, I just lost respect for two more women in the world, that's it! Once again the nation's weather forecasters have forgotten the small state just above the The Carolinas, Delaware. Oh, and the parts of Maryland & Virginia on the peninsula. Shoddy reporting. Y'all are missing the point-It's all about NYC !!! There's no way they could evacuate Manhattan if they had to-physically impossible considering the numbers. I'm glad I live in Buffalo-no hurricanes/tornados/earthquakes here. Evacuation of 10 million people in the Megalopolis area, many relying on public transportation, would make the Katrina Evacuation seem small scale. The worst case scenario isn't very likely, despite all the strident warnings. My bet is most New Yorkers would not leave no matter how dire the warnings get. Ugggggh – you're thinking of Tropical Storm Fay (2008) – that's the one that went over and back (I live in Volusia County, where Fay dumped something in the area of 80 million- yes million- gallons of rain in a 36 hour period); Charlie made landfall at Port Charlotte and came up the spine (I honestly thought it'd be a tropical storm when it got to Volusia Cty, not a Cat 2!!) and exited at Daytona Beach. Then we got hit with Frances and Jeanne. Ivan hit the panhandle that same year. But you're right, after a while they all start to blur together. I've been in eight hurricanes and at least 15 tropical storms (price you pay for Florida's mild winters) – and I don't live in some rich coastal town, we're pretty poor here in Volusia County for the most part. Lock must be thinking of Lauderdale and Miami – the rest of this state is like the rest of the South. Agree that if you get an evacuation order, you heed it. NO should have evacuated the entire town – or else taken all the federal money they've been given over the last *century* and upgraded those levees like they were supposed to , not build a brdige across Lake Ponchatrane. What, now there's uncertainty in the hurricane market too?!?! How do I sell my shares in Irene (IRE)? They forgot the "cone of silence." "LIFE" is a cone of uncertainty. ALWAYS be prepared.........................................for anything. WE DON'T HAVE A REPUBLICAN DIP STICK IN THE WHITE HOUSE THIS TIME !!!!! MABE SOMETHING WILL GET DONE IN A TIMELY MANNER THIS TIME!!!!! IF HE DOSE'NT HAVE TO FIGHT WITH THE REPUBLICAN CRIMINAL'S THAT ARE CONTROLLED BY THE TEA PARTY THAT IS !!!!!! NO MORE YOU'ER DOING A HECK OF A JOB BROWNIE!!!!! Is it perfect? Far from it. What everyone needs to remember is that the models they provide are only as accurate as the data the collect. If they have more sensors (ie. more data to observe) they can get more accurate. I'm not a big fan of government spending, but a partnership between the states, business, real estate developers, and insurance companies, would be well advised to invest in more data gathering for large storms like this. a party that only has money in their hearts.